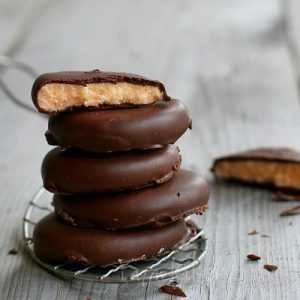 Have you ever made homemade Peppermint Patties? I did for the first time last year, and man are they easy. And SO delicious. Because of my great love for these delectable palate cleansers, I decided to give them a fun twist! McCormicks yellow food coloring, and pumpkin extract into mixer. Start on slow and let all ingredients blend together. If mixer seems to struggle, you can go up one speed. Once powder sugar is mostly incorporated you can increase speed until mixture is fully combined. Take a heaping tablespoon and roll it into a ball. Place on baking sheet. My baking sheet fit about 24. Take a glass and press each ball down into a flat disc. Do this to all the pumpkin mixture and then place in the freezer for 15-30 minutes. Place semi-sweet chocolate into a microwave safe container and melt chocolate in 30-second increments, stirring well after each 30-second interval. When chocolate is mostly melted (some chunks can remain) add in shortening. Place back in microwave for 15-30 seconds. Remove one tray of pumpkin discs from freezer. Place one disc on fork and dip into thin chocolate mixture. Let excess chocolate fall back into bowl and then place chocolate covered pumpkin disc on parchment lined baking sheet. Chill for 30 minutes (or an hour at room temperature) and enjoy!